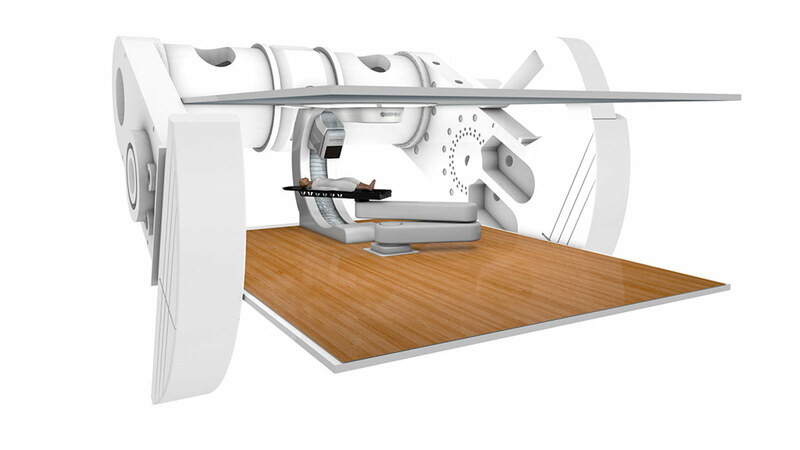 The MEVION S250i™ with HYPERSCAN™ pencil beam scanning technology delivers high-quality, robust Intensity Modulated Proton Therapy (IMPT) treatments at hyper-speed and without compromise. Featuring Mevion’s Adaptive Aperture™, HYPERSCAN delivers high quality, robust pencil beam scanning for IMPT. Adaptive Aperture can automatically tailor beam characteristics to match at tumor at any spot and depth. The benefits are a sharper penumbra that eliminates dose uncertainty and delivers less radiation to healthy tissues. It is ideal for treating shallow pediatric or brain tumors, where small spot sizes are difficult to achieve. The Adaptive Aperture is a ground breaking low profile Multileaf Collimator (MLC) system specifically designed for pencil beam scanning. The system uses a fully automated adaptive aperture that generates layer-by-layer specific beam collimation and blocking identical to conventional proton therapy apertures. Sharper Spot Size Collimation: 1 to 3 mm collimated spot sizes (sigma equivalent) for all energies: 0-32 cm depth. Faster Volumetric Scanning: Scan a typical lung tumor in < 2 seconds. Robustness Lowers Clinical Uncertainty: 10-50x faster scanning and 2-3x sharper compared with non-IMPT treatments. Clinical optimization: Image quality and robotic precision merge for < 1 mm IGRT positioning with in-room 3D imaging. The MEVION S250 Series provides precision treatment from every angle with 190-degree rotating gantry arms with the world’s only gantry-mounted proton accelerator.